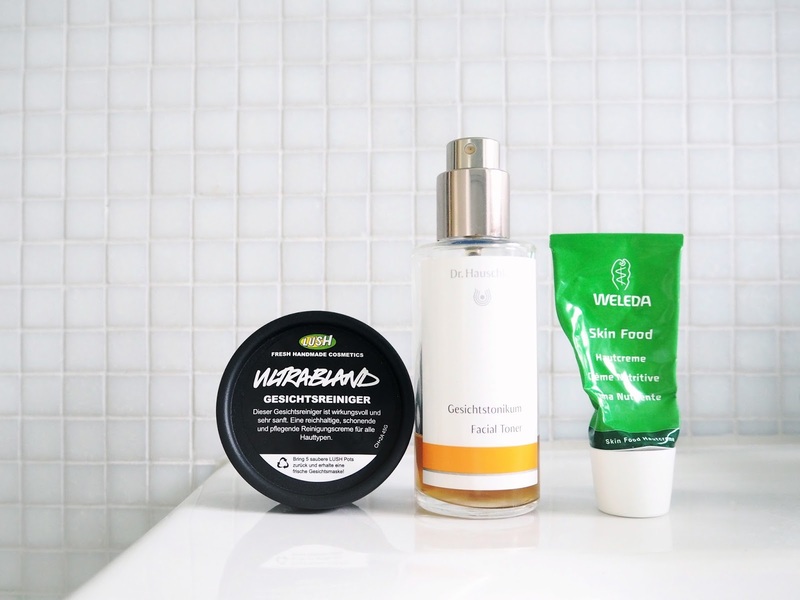 I've been somewhat hesitant to write a post on my skincare routine for a while, because skincare is something that's so individual and I've been switching up the products I use for years. Recently, however, I've settled down and found a few bits that seem to be working well for me. I used to have quite the skincare routine, with elaborate and somewhat unnecessary extras, so I've whittled it down and am now keeping things nice and minimal! To give you the full lowdown, my skin is combination and tends to veer between dry and oily, however has been leaning more to the drier side in the last six months or so. These products are what have been working for me lately and have been doing a good job at keeping my skin in check! Lush Ultrabland Cleanser - I know this might seem like a really heavy cleanser to use for the morning, but it actually works really well! I only use a small amount of this, but as long as I remove it properly it leaves things nice and smooth without leaving any residue. Since my skin has taken a turn for the very dry these last 6 months, I've found this cleanser to be a fab one for keeping my skin clear without drying it out at all. I've gone through about five of these so that in itself speaks volumes! Dr. Hauschka Facial Toner - Toner and I have a bit of a difficult relationship. I feel like sometimes toners completely break me out or do absolutely nothing at all for my skin, so when I find one I like I tend to stick to that! That was the case with this one. I really didn't have high hopes when I first tried it but sure enough, a few days into using it my skin had completely cleared up and was much smoother in texture. That coupled with the fact that it didn't dry out my dehydrated skin meant I was onto a winner. As an added bonus, this lasts absolutely ages. I've been using it every day for four months (and I like to spray this liberally) and I still have about a quarter left! Weleda Skin Food Cream - This is another product that may well seem a bit heavy for the AM, but my skin gets quite dehydrated throughout the day, so this does a great job at preventing those dreaded dehydration lines. It's essentially a very thick moisturiser that leaves you looking dewy and creates a lovely base for foundation. I use a really small amount and spend a little while massaging it into my skin. I usually let this sink in for about 10 minutes or so before I do my makeup and I find that it actually sinks in quite quickly! The smell is not my favourite; it's a strong, citrusy scent but the good news is that it doesn't really stick around so you needn't worry if you're bothered by fragrance! So there we have it, my very minimal skincare routine. Although I am occasionally in awe of bloggers who have about 10 steps to their skincare routines and a bevy of exciting skincare products, my skin just seems to prefer it when I use less! What are some of your favourite skincare bits? I'd love to hear any of your recommendations! I never have the energy to do anything elaborate with my skin in the morning, so your routine seems manageable!